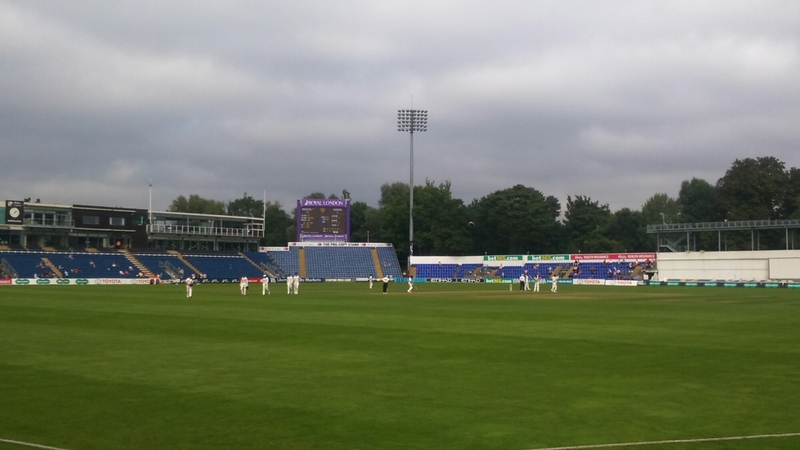 As this eventful summer draws to a close I thought I’d make the most of my part-time status and take a day off to sample the last game of County Cricket at the Swalec Stadium in Sophia Gardens. This was the second day of Glamorgan’s match against Gloucestershire. Day 1 had seen Glamorgan bowled out for 220 and Gloucestershire reach 62-3 in reply at stumps. Glamorgan’s bowlers strained for the early wickets they needed but they didn’t create enough pressure to precipitate a collapse, and Gloucestershire ended on 347 for 8. Young legspinner Carlson bowled particularly well, but didn’t have much luck. County Cricket is very relaxing. Neither a tense as Test cricket nor as hectic as limited-overs, it has its own kind of atmosphere and goes at its own tempo, absorbing in its own modest way. UPDATE: Gloucestershire were all out for 363 on the morning of Day 3. Glamorgan then predictably struggled with the bat yet again, and were bowled out for 232 leaving Gloucestershire 90 to win. Their openers rattled off the runs in fewer than 20 overs by 5pm. Gloucestershire won by 10 wickets.